A trainer from Loro Parque, Puerto de la Cruz is in hospital after she was injured on Saturday during a training session with one of the killer whales. 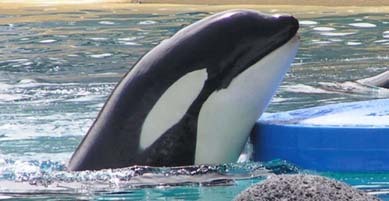 The orca crashed into the trainer, injuring her right lung and breaking her forearm in two places. She was rescued by two colleagues after the mammal dragged her down to the bottom of the pool and is now said to be stable after surgery. A press release issued by the Park after the incident made no mention of the deliberate actions of the whale and put the injuries down to an unfortunate collision.